These images of three galaxies from the Galaxy Zoo (top) and STAGES surveys (bottom) show examples of how the newly discovered population of red spiral galaxies on the outskirts of crowded regions in the Universe may be a missing link in our understanding of galaxy evolution. Scientistshave spotted a rare class of galaxy that could represent a cosmic halfway housebetween two stages of galaxy development. Galaxiesusually fall into one of two categories: pinwheel-shapedspirals that tend to be blue or reddish, egg-shaped ellipticals. But nowastronomers have discovered a group of red spiral galaxies that could be themissing link between the two main types. Scientiststhink many galaxies begin their lives as spirals, when burstsof star formation create young, hot, blue stars in clumps that createspiral arms. As stars age they get cooler and redder, and without fresh starformation in a galaxy, the lumpiness of spiral arms tends to settle down into asmoother, rounder shape. Thenewly-discovered red spiral galaxies could present atransition point between young blue spirals and old red ellipticals. "Wewant to establish the link between the different stages more firmly," saidChristian Wolf, an astrophysicist at the University of Oxford. "At themoment what we see is that one type of galaxy gets replaced by the other. Butwe have not been able to watch any individual galaxy for millions of years andestablish that it changes along this particular route." Thoughsome red spirals have been spotted before, there were so few of them thatresearchers couldn't be sure if they were isolated phenomena or represented amore common stage of galaxy evolution. Butrecently two teams independently observed significant populations of thesegalaxies. 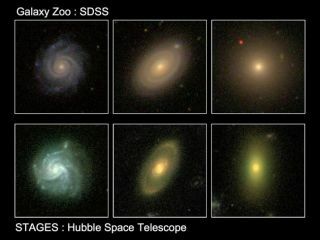 The Galaxy Zoo project uses volunteers from the general public toclassify galaxies in images from the Sloan Digital Sky Survey of the localuniverse. A separate project, the Space Telescope A901/902 Galaxy EvolutionSurvey (STAGES), used the Hubble Space Telescope to observe a region of spacecrowded with galaxies known as the A901/902 supercluster. Both teams weresurprised to find so many red spirals. "Wehave been used to just sorting galaxies by their color ? red and blue,"Wolf told SPACE.com. "We needed either the Hubble Space Telescopeto see their morphology more clearly and say that some of these red galaxiesare actually spirals. Or we needed a much larger sample, such as Sloan DigitalSky Survey with Galaxy Zoo, to really spot them." Thesetransitioning galaxies tend to be located in more crowdedareas near other galaxies, and their setting could play an important rolein shutting down star formation, allowing them to morph from spirals toellipticals. Scientists aren?t sure exactly why the creation of new stars getsturned off in galaxies, but one hypothesis is that in crowded regions, hot gasdrives out cold gas, which is necessary for the clumping of matter that birthsnew stars. If the cold gas were driven out of galaxies in congested areas,causing them to stop forming stars, their existing stars would age and becomeredder, making the whole galaxy appear red. Additionally,most of the red spirals the researchers found are large galaxies, whose heavymass also appears to affect their transition. It appears that lower-massgalaxies might make the changeover from spiral to elliptical more quickly,which would make spotting red galaxies that are still in their spiral shapetougher. Since larger galaxies could spend more time in this middle phase,astronomers are more likely to find large red spirals than small red spirals. "Justas a heavyweight fighter can withstand a blow that would bring a normal personto his knees; a big galaxy is more resistant to being messed around by itslocal environment," said Galaxy Zoo team member Bob Nichol of PortsmouthUniversity. "Therefore, the red spirals that we see tend to be the largergalaxies - presumably because the smaller ones are transformed morequickly." Wolf andother members of the STAGES team found that the red spirals hadn't completelyclamped down on star formation. In fact, low levels were still going on, butthis activity was masked behind a shroud of dust. "Bluespirals have a similar amount of dust, but blue spirals have so much starformation, so despite dust it's still clearly visible," Wolf said. In thered spirals, the astronomers could only spot the star formation inlong-wavelength infrared light, which can pierce through the dust clouds intothe galaxies' hearts. Bothteams plan to detail their findings in an upcoming issue of the MonthlyNotices of the Royal Astronomical Society.